Tigh An Aullt is located in a part of the Scottish Highlands knows as Kintail and is situated between the western end of Loch Duich and the eastern end of Loch Cluanie. This area is home to 17 munros, the most famous of which are The Five Sisters of Kintail, which the cottage sits at the foot of. Many consider Kintail as one of the last great wildernesses. The greater part is now owned by the National Trust of Scotland and Kintail and Morvich estates, which cover an area of approximately 29 square miles, or put more simply more than 18,000 acres. The area has had a turbulent history from the early Viking invaders to the Jacobite uprising, which culminated in the battle of Glenshiel in June 1719, where a rebellion army was crushed in a single battle. This was the last engagement between English and foreign troops on the mainland of the United Kingdom. Whilst staying at Tigh An Aullt there are many places to visit within the local area, we have put together some information below to help you plan your outings. Please use the Google map and address provided below to get a better understanding of the location of Tigh An Aullt. Please note this address should not be used for any correspondence, instead please use the address provided on our Bookings and Contact page. One of the most picturesque places to visit in Scotland is Shieldaig, which is located on the edge of Loch Shieldaig. The village is home to beautiful white-washed cottages set out alongside the shore of the loch and scattered up the hillside. From the grassed over area on the seaward side of the road running through the village visitors can enjoy the wonderful views and some of the most breath-taking sunsets. Within the village there is a lovely shop and Tigh an Eilean Hotel, which offers outstanding dining. There is also the Shieldaig Bar, which has a roof top terrace, and Nanny’s Café that is a firm favourite with many visitors. Based at Shieldaig is Torridon Sea Tours, which have a great sea food cruise suitable for both old and young. 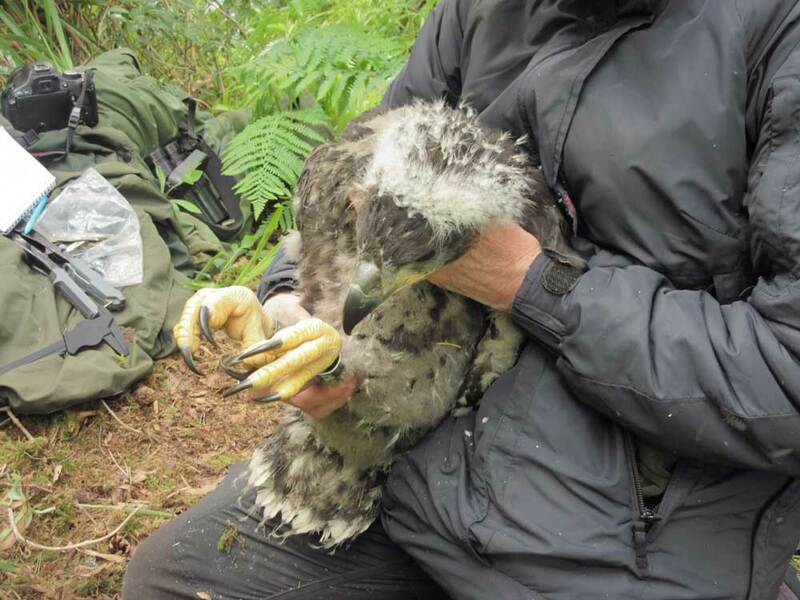 In recent years a pair of nesting Sea Eagles have made their home on Shieldaig Island and are now permanent residents of the area and regularly seen in the skies above the village and hunting in the sea beyond. Last year they gave birth to two healthy chicks. So named because this iconic route covers 500 miles of stunning Highland scenery starting from Inverness and taking in the regions of Wester Ross, Sutherland, Caithness, Easter Ross, the Black Isle and Inverness-Shire. The route provides a route map which takes in stunning coastal views, Highland scenery and wildlife, castles and of course the occasional whisky tour! The remote village of Applecross is tucked away on the West coast of Scotland in the region of Wester Ross on a wild peninsular. The village’s remoteness is highlighted by the fact that there are only two ways in, one, known as “the coward’s way” along the coast road from Shieldaig or travellers can brave the Bealach na Ba, the highest road in Britain, with spectacular views across to Raasay and Skye. The road rises to 2053 feet in just 3 miles with a 1 in 3 gradients so not for the faint hearted. The village is known locally as “The Street” probably because that’s pretty much what it is, with a row of pretty cottages along one side and the sea wall on the other. Applecross is also famous for it’s award winning pub/hotel The Applecross Inn which has won awards for its excellent cuisine. Whilst the village itself has a small beach where you can hire kayaks and boats for the best beaches wonder a couple of miles up the coast and discover a beautiful expanse of white sandy beach with 70ft sand dunes on one side. Plockton’s claim to fame is that is was once the setting for the TV series, Hamish Macbeth. This pretty little village has a very temperate climate, and for this reason is one of the only places in the north west of Scotland that grows palm trees. There are lots of places to eat in the village, as well as plenty of shops and art galleries. Some of the places to enjoy a meal, include plockton hotel, The plockton inn and plockton shores restaurant, which serves fine food on the waterfront. Combine your visit to Plockton with a seal watching trip with calums sealtrips. Calum’s Seal Trips have a number of cruises available and also a ‘free if no seals’ guarantee. Before the bridge to Skye was built, Kyle was renowned for the amount of traffic waiting to board the ferry. Today, it is better known for its shopping and facilities, including a supermarket, a butcher, a post office and a pharmacy. The town also has its own railway station with trains going to Inverness and special steam train trips available. Setting sail from the town is a glass bottom boat, which gives its visitors a new way to see the shores off the Scottish coast. Seaprobe atlantis has won several awards over the years, and as well as letting you see what’s below the waves, you can also look out for seals, otters and dolphins. A highlight for many visitors to the part of the Highlands is Eilean Donan Castle, which was originally built in 1214 in defence against the Vikings. It was later destroyed by Government troops during the Jacobite uprising. In the 20th century it was rebuilt as a family home, and today it is open as an attraction and one of the most visited castles in Scotland. The castle is located on a small island connected to the main land by a small bridge. Visitors can explore nearly every part of the castle and discover the history of this iconic attraction. There is free parking at the castle, as well as a café and gift shop. Visiting Glenelg is a wonderful day trip when staying at Tigh An Aullt. To access the glen you have to drive over Mam Ratagan, which is a smaller version of the Bealach Na Ba, which leads to Applecross. Once in the glen there are several places to visit, such as the ancient brochs, and the Applecross peninsular. There is also the Glenelg Inn, which is a nice place to eat. There are excellent walking opportunities in Glenelg www.walkhighlands.co.uk, some of which was the setting for Gavin Maxwell’s Ring of Bright Water. Alternatively, the last running turntable ferry skyeferry.co.uk to Skye sets sail from Glenelg jetty and is a wonderful way to see the local scenery. The isle of skye is only a 15-mile drive from Tigh An Aullt and well worth a visiting when staying at the cottage. Skye is the largest island in the Inner Hebrides. The south of the island is called Sleat and known as the Garden of Skye. North of Broadford lies the Cuillin Mountains, which are one of the most majestic ranges in Scotland, beyond this the island is more rugged and desolate. Once on the island there are several attractions to keep everyone entertained, including Dunvegan Castle, the Clan Donald visitor centre and Talisker Distillery malts.com. If you are look to explore the islands beyond Skye, CalMac ferries run to the Outer Hebrides from Uig, whilst in the south ferries leave Armadale Pier for Mallaig. There are also several wildlife trips around the island, such as those to see the sea eagles, dolphins and whales. Please note Skye can be accessed via the bridge, or ferry skyeferry.co.uk from Glenelg. We hope you have fallen in love with Tigh An Aullt and are now looking to book your Scottish Highland holiday in this beautiful self-catering cottage. Booking your trip could not be easier thanks to our simple online booking calendar. Alternatively, if you have any questions or wish to speak to one of the friendly My Favourite Cottage’s team, please contact us via email or on 01271 377 432 and we will be more than happy to assist you.